WHAT IS THE TURKISH BATH RITUAL? Originating from modern day Turkey, the concept of a Turkish Bath is similar to that of a sauna but also closely related to ancient Greek and Roman bathing practices. The main difference between the two bathing practices is that the ancient Turks preferred to use running water to cleanse, whereas the Greeks and Romans used communal pools. A Turkish Bath in Turkey, is most commonly known as a Hammam and means “steamy bath”. The design of these Hammam’s have predominantly been based on three main principals, which is to purify, detoxify and rejuvenate the body. Bathing in a Hammam first starts with an journey of relaxing the body in a room heated with a continuous flow of dry hot-air (similar to that of a sauna). Once the body has sufficiently perspired, bathers are then moved to an even hotter room to cleanse and purify the body. When bathing is completed, bathers finally retire to the cooling-room for a period of relaxation. 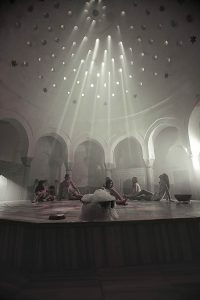 To understand why Turkish Baths are so unique and how this bathing ritual can be incorporated into modern day bathing practices, we have explored the benefits of using sauna’s and steam rooms. Benefits of Steam or Dry Hot Air For the Body? The use of humidity and steam in steam rooms provide a number health benefits to the body. Not only does the heat in these rooms relax stiff joints and muscles they also promote healthy blood flow, and assist with the body recovering – due to the increase in circulation. They are a great remedy for people with circulatory issues however caution needs to be taken for people with heart conditions, as the heart rate doubles. They are also best used for clearing sinus and respiratory pathways. On the skin the humidity provides a wonderful way to maintain a great complexion. Ever remember that trip to somewhere like Singapore? The skin feels so good! Saunas provide the same benefits with the main difference being, that they are a lot more hotter than steam rooms and the other being that dry hot-air is used compared to warm wet air in steam rooms. The dry heat in sauna’s are great for people with rheumatoid arthritis as the humidity in steam rooms may cause aggravation. Traditional Turkish bath houses have a combination of both through the use dry and wet rooms. WHAT HAPPENS TO THE BODY WHILE USING A STEAM ROOM OR SAUNA? As the body temperature increases significantly in either room, the body starts to sweat, opens pores and begin to release toxins. In addition to perspiring, the increase in body temperature may put body into a state of hyperthermia meaning when body temperature is increased more than standard temp (similar to when you are sick) many invading organisms that enter the body are reduced assisting the immune system in fighting them off. That’s why working out is so good for you! To truly understand the health benefits of a Hammam Ritual and reap these benefits in modern day bathing practices, we have simplified the experience into 3 easy steps. Our visit to a Turkish Bath House, was to the famous Cemberlitas Hammam found in Istanbul, Turkey. The first sensation of entering this traditional hammam was noticing the magnificent architecture of the building. Provided with a private room to undress and prepare for the experience, we were provided with a towel like cloth known as a ‘Pestemal’ similar to a sarong to cover ourselves, before entering the warm room. Disclosure: Full rights of images used belong to Cemberlitas Hammam. Entering the warm room is like travelling into a hot exotic place with echoing voices, filled with steamy clouds and an overwhelming smell of fresh soap. The room itself, is mainly covered with marble floors and walls made up of high doomed ceilings carved with small circles to provide glimpses of natural light. In the centre is a huge octagonal-shaped marble bench (raised from the ground) which is used for massaging and scrubbing bathers. Small allocated spots with gold taps and basins provide bathers with areas to cleanse their body. Seated on a marble floor we relax and unwind while pouring warm water over ourselves allowing our body to sweat. This step encourages the body to firstly enter a state of relaxation, soften the skin and commence it’s detoxifying journey. Now comes the fun part of deeply cleansing and renewing our skin. After allowing our body to sweat for 10-15 minutes in the warm room, our skin is ready to be massaged and purified with a deep exfoliation textured coarse cloth known as ‘kese’, which is an exfoliating cloth in the shape of a mitt. The therapist lays us on the large octagonal shaped marble and pours timid water onto our body to settle the sweating. The kese is then used to scrub (deeply exfoliate) and massage our whole body until it is silky smooth. This is where layers of dead skin comes rolling off our bodies. The deep exfoliation treatment is one of the most common reasons why people in Turkey visit a Hammam. While our body receives this amazing scrub – the mitt is also simultaneously performing a massage, further relaxing our muscles, boosting blood flow and removing toxins through our lymph glands. The sense of invigoration is so intense – it’s truly hard to describe. Mitten deep exfoliating mitts have been crafted specifically to replicate this amazing deep exfoliation treatment (without the need to sweat for long-periods) in the comfort of modern day baths and showers. bubbles from a soft fabric (which looks like a pillowcase) onto our entire body to cleanse and soothe the body. Our skin is further massaged with soapy bubbles and then rinsed off with cold water which is used to encourage hydro therapy, reduce inflammation and close off pores. The feeling of invigoration is so intense – it almost feels like an awakening of all senses within the body. End result? Squeaky clean skin – soft as a new born with a body that feels light as a feather. To receive product promo codes, partner offers and the latest Mittens’ goss.